Texas Representative J.M. Lozano is not a new face in the House of Representatives, but he is a new face as a Republican State Representative. Lozano, who was a conservative, blue dog Democrat, changed parties last year, and in the interview below, you can hear why. I was very impressed with his story. Rep. Lozano invited us to sit in the House of Representatives Chamber at the Capitol to talk about his first day in the 83rd Legislative Session. He spoke about the values his family taught him such as hard work and faith. Rep. Lozano has built, owned and operated successful restaurants, so he knows first hand what it takes to build a business and keep people working and out of the unemployment line. Representative Lozano knows the importance of energy exploration to his district, which is why he has sided with conservatives in promoting oil and gas development instead of the radical environmentalists who want to stop it. Lozano is pro-life, pro business, and pro oil and gas exploration. Representative Lozano is fluent in Spanish, so I also interviewed him in Spanish, in which he shares his story of why he switched parties. Click here to view our Spanish interview. Adryana Boyne: Hello we’re here with TexasGOPVote and VOCES Action, and I have the honor to be sitting next to Representative J.M. Lozano from District 43. I appreciate that you welcome us here in the House Chamber. J.M. Lozano: Yes the floor of the House of Representatives, this is your House, and this is where all the work gets done. Adryana Boyne: That is wonderful, Representative J.M. Lozano District 43, can you tell me what covers your district? J.M. Lozano: District 43 starts in Bee county and goes down to Jim Wells County and San Patricio County and then Kleburg County. It’s a great district; the geography of it and the issues are uniform. Oil and gas, agriculture, ranching. We have industrial jobs on the port of Corpus Christi and San Patricio and then we have the Eagle Ford Shale. It’s got a university with A&M Kingsville, it’s got Coastal Bend College in Beeville. It’s an incredible district that has a very bright future. Adryana Boyne: That’s wonderful. 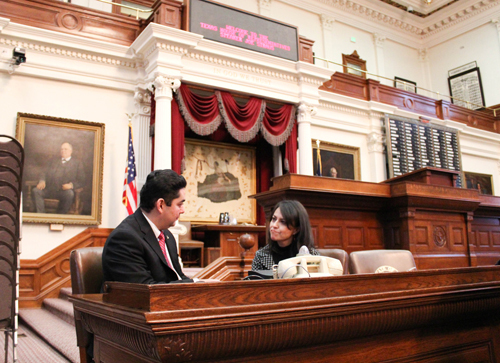 Representative Lozano, today we have the beginning of the new session in 2013 in Texas. Can you tell me what you are looking forward to during this upcoming session? J.M. Lozano: Yes, the future of Texas is extrememly bright in energy resources. I’m on the energy resources committee and I’m hoping to get reappointed to that commity again and my job is to continue to fight for the jobs that can allow families to have the salaries to buy homes and cars as apposed to renting. To create a savings, and to have health insurance, those type of jobs, not minimal wage jobs and these jobs are in the oil and gas industry. Some of the legislation that I will be proposing will be to allow more oil and gas exploration, not only in the Eagle Ford Shale area, but in other shale areas, where there are bands of shale beneath Eagle Ford Shale that run more south…and to create more jobs. There was a recent­­ report that showed the revenue estimates are far higher than anyone anticipated and that’s due in a large part to oil and gas exploration. Adryana Boyne: That’s wonderful news. Representative Lozano, I know you get asked this a lot, but this is your first time as State Representative as a Republican, you recently switched parties. Can you just tell us briefly why you switched parties? J.M. Lozano: You know last time I ran for office, I ran as a conservative democrat and so my district went from Kleburg County all the way down to Cameron County, close to Harlingen and La Feria and close to Brownsville, and so even though the area was predominantly Hispanic, and predominantly Democrat, I focused on issues that crossed party lines in our culture. In the Hispanic community, we’re by and large pro-life, we’re pro-gun ownership. I’m a sportsman, I hunt, I grew up in a rural area. We’re pro oil and gas jobs, because down there in South Texas it’s a predominant thing. Those are the best jobs. So when I came up to the Legislature…and I was elected…I was campaigning for welfare reform down there and I had people agreeing, and I got elected as a Democrat talking about conservative issues and then when I came up here and tried doing those things, I realized there was resistance and there were moments on the floor as you see the floor here, where I vote and I have a Democrat caucus leader tell me to come and change my vote and I look at them and I say I vote my district, my community, and you vote your district and your community and they didn’t like that and so as the session went on, I realized there was no room for a conservative in the Democratic Party in the House, and the Republican Party was there for me last session when the Democratic leaders tried to kill my legislation. The Republican party helped me because it was good legislation, but ultimately because I saw there was the conservative values that I was raised with, that my constituents have, are only represented in the Republican party. Adryana Boyne: I appreciate that you shared that, and we’re looking forward to see what is coming in the upcoming months in session, but I would like to say thank you on behalf of the people of Texas for your service to your district and the people of Texas. Thank you!